Birthplace : New Orleans, Louisiana, U.S.
Earl King was an American singer, guitarist, and songwriter, most active in blues music. A composer of well known standards such as "Come On" (covered by Jimi Hendrix) and Professor Longhair's "Big Chief", he is an important figure in New Orleans R&B music. Earl King, whose career spanned five decades, survived shifting tides of popularity to record a solid catalog of blues music. As well as being a gifted musician, King was also an astute businessman who ran his own label and maintained the rights to his music, a rarity in his time. King was born Earl Silas Johnson IV on February 7, 1934, in New Orleans, Louisiana. He was the seventh son of a blues pianist who played with "Tuts" Washington. His father died when King was a baby, leaving his mother, affectionately called "Big Chief," to raise the family. King sang in the Antioch Baptist Church choir as a boy, and also formed a gospel group with some neighborhood friends; they sang on street corners, which started his blues career. "One day I was standing on a corner with my friend John Davis," King recalled to Jeff Hannusch in Offbeat magazine. "He was playing the guitar and I was doing a few gospel songs. A man came up to us and said, 'You boys ought to be singing the blues because you could make a lot of money. Gospel music don't pay too much.' His name was Victor Augustine and he had a shop on Dryades Street. He told us to drop by to see him because he knew some talent scouts and he might be able to get us recorded. A few days passed before we had built up enough nerve to check him out.... Doc [Augustine] introduced us to the piano player, Huey Smith. Huey gave me the words to a few boogies and we went from there." Smith gave King his first real singing job, performing with his group at a New Orleans club called Algiers. Since Smith couldn't afford to hire both a singer and a guitar player, King learned to play the guitar as well. Smith also entered King in weekly talent shows at the Dew Drop Inn, a leading black nightclub, and at the Tijuana, where King often first prize. "The Tijuana opened me up to a new circle of ideas and ambitions," King reminisced to Hannusch. "Back in the early 1950s the Tijuana was a real scene. I got to meet a lot of musicians that were in the same bag I was into--Ernie K-Doe, Billy Tate, Eddie Bo, Robert Parker and Lloyd Price. A lot of jocks and talent scouts were in there too." One of King's major influences was Guitar Slim: "[He] gave me the idea to write songs from a psychological approach--saying things that people want to hear. He also taught me how to build a song. Make the second stanza stronger than the first and the third stronger than the second," King told Offbeat. In fact, King copied Guitar Slim's style so well that King replaced him when Slim became too ill to make a road trip to Atlanta. During the performance, he followed an up-and-coming piano player named Ray Charles. As King told the story to New Orleans Magazine, the announcer, who didn't know about the switch, introduced King as "the star of the show, Guitar Slim!" When King stepped up to the mike and sang, "[t]he lid blew off the house, man," he continued. "Money went flyin' everywhere ... The band put all of their instruments down and helped me collect the money." King cut his first record, "Have You Gone Crazy?" b/w "Begging at Your Mercy," for Savoy Records after winning a talent audition in June of 1953, but the label didn't promote the release. After King was picked up by Specialty, Guitar Slim's promoter, however, his first release, "Mother's Love" was a success. The label originally intended to bill him as King Earl, but the pressing plant mistakenly flip-flopped his name, listing him as Earl King. By this time, though, his similarity to Guitar Slim's style began to work against him, as distributors confused the two. "I even saw on some juke boxes, 'Mother's Love' was listed as by Guitar Slim. Slim was stark raving mad I was so close to his sound and it posed problems at the label trying to promote two artists that were so close," King said in Offbeat. King had several subsequent releases with Specialty, but, unable to score a hit with any of them, signed with the Ace label in 1955. Here he scored public attention and noticeable sales for the first time with "Those Lonely, Lonely Nights." The single was followed by "Well O Well O Well O Baby," "Weary Silent Nights," and "Buddy, It's Time to Go." King left Ace in 1959 after a contract dispute, but was immediately signed by Dave Bartholomew at Imperial. "Earl was a hard worker," Bartholomew told Offbeat. "He had a lot of ideas and suggestions that were valuable. Earl could really write good, catchy songs. I have a lot of respect for Earl." 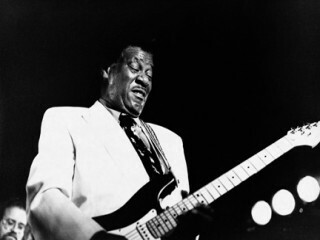 While with Imperial, King released "Come On (Let the Good Times Roll)," which failed to chart but was later picked up by both Jimi Hendrix and Stevie Ray Vaughn. His recording of "Trick Bag," inspired by a story his grandmother told about his father, did well locally. King continued to write, penning minor hits for Fats Domino and Berna Dean; some of his own recordings, like "Always a First Time," skirted the bottom of the national R&B charts. In 1963 Imperial was sold to Liberty Records, another nail in the coffin of the New Orleans music industry. Determined to succeed, however, King and several others headed to Detroit, the home of Motown Records, only to have their hopes dashed when Joe Jones, who had brought the New Orleans group to Detroit, tried to drive too hard a bargain and alienated Motown label owner Berry Gordy. Undaunted, King returned to New Orleans and set up his own label, Hot Line, which released several local and national hits, including the Mardi Gras anthem "Big Chief." During the mid-1960s, however, Dover Distributors tried unsuccessfully to pull Hot Line and a number of other small labels together in an attempt at national promotion and distribution. When Dover and Hot Line collapsed, it took still more of the New Orleans music scene with it. Instead of leaving the city, though, King stayed put--writing a book on songwriting, studying metaphysics, and trying to make his publishing catalog more effective. In the 1970s, King went back to performing, putting in appearances at uptown clubs and the Jazz Fest. In 1972 he cut an album with Allen Touissant that was intended for Atlantic. The deal dissolved, but a single, "Street Parade" was picked up by Kansu on Sea-Saint's house labels, and became a popular Mardi Gras song. In the 1980s, many of King's classic recordings were reissued by EMI, giving him a resurgence in popularity. He signed with the local Black Top label, and became a contributor to Glazed, a collaboration with Roomful of Blues that earned a Grammy nomination for Best Contemporary Blues Album in 1988. He released a total of four CDs with Black Top. When asked about his greatest achievement, King told Offbeat, "To achieve the ability to work with so many musicians in America and around the world." Unlike many artists of his time, King retained the publishing rights to his compositions and was able to live off them until his death at age 69 on April 17, 2003, from diabetes-related complications.